As Halloween as jack-o-lanterns, witches, and black cats the mysterious and misunderstood bat has sent chills down spines for generations. Its association with the dark, its nocturnal activities, ungainly and sometimes frightening appearance have led many to fear the bat. Recently alarms have been raised at large scale disappearances in the northeast of these small winged mammals, creating greater awareness of the importance of the bat’s place in ecosystems worldwide. Fortunately, our resident bat species have not seen a marked decrease in size that their northeastern counterparts have. In the interest of developing a greater understanding of the native and transient bat populations on the Flathead Indian Reservation, a few Salish Kootenai College students are assisting in laying the groundwork for a body of bat knowledge. SKC students Kole Cordier and Kenneth Edmo, under the tutelage of faculty members Dr. Regina Sievert, Janene Lichtenberg, and Eric Richins, spent this summer monitoring bats on the Flathead Indian Reservation in the hopes of continuing to build a base for a larger body of research regarding the bat populations in the area. In September Kole Cordier presented the students’ findings to staff and faculty. 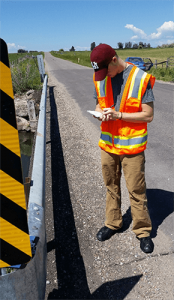 Their research built on their own 2015 study of the majority of the 152 bridges, wildlife crossings, and culverts on the Flathead Reservation. It was in-part inspired by a 1999 study that indicated bats would not be present in northern states’ bridges as “few are warm enough to meet bat’s needs”. The 2016 study pared down the number of sites and focused on 14 bridges that indicated the greatest presence of bats. The indication? Bat sign. That specifically would be guano and urine. 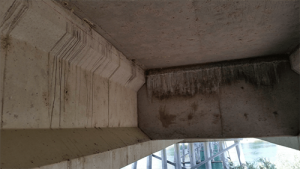 Their research sought to determine how bats’ usage of these bridge sites changed throughout the summer. 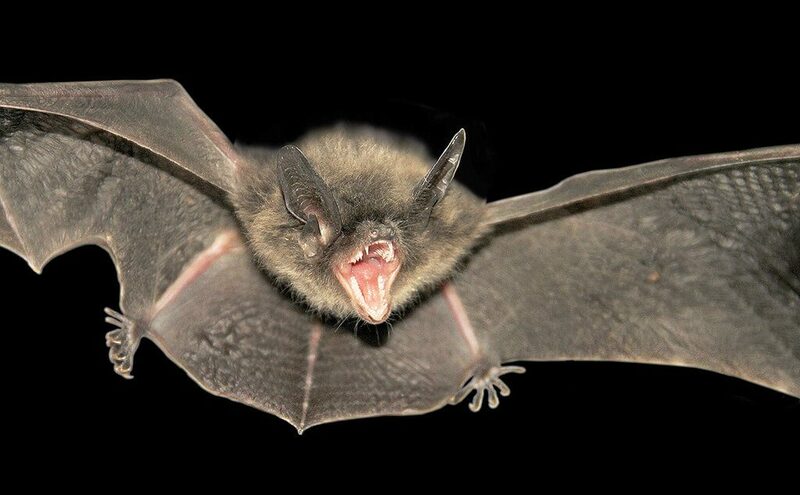 Cordier and Edmo visited each of the 14 sites at least three times during the duration of the summer measuring the amount and change in bat sign. At each visit a site was given a ranking of 0-4, 0 meaning no sign or change of sign viewed, and 4 meaning that a large amount of sign or change of sign was viewed. Based on prior research, the pair expected to see the bat sign rise from an average rank of 1.5 in the early summer, peak at nearly 3.5 between July 5th and August 5th, and dropping to a final average rank of 2.5 by early September. When asked how the increase or decrease of bat sign was observed and compared to past visits, Cordier explained. “That was the hard part, that’s probably the most bias in the study this summer.” How does one tell the difference from old guano and new guano? Not by just by looking at it. Sometimes science is dirty and in this case Cordier and Edmo had to get their hands dirty. “Basically just kinda look at it and smash a few of them (guano samples),” said Cordier. The consistency of the guano seemed to give the pair the most objective indication of the age of the sign they were studying. By the end of the summer, Cordier and Edmo saw that their findings were not far from their original expectations. While the results of the data collected was less pronounced than expected, the general shape of the data curve was similar. Their data indicated a higher presence of sign in the early summer with an average rank of a little over a 2, with the mid-summer indication of approximately 2.8,quite a bit lower than their pre-study expectations, and the late summer observation found itself much closer to the 2.5 of their pre-study numbers. 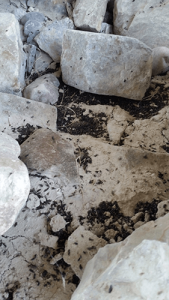 Cordier’s and Edmo’s data indicates that the bat colonies usage of bridge site on the reservation increases in the middle of the summer (July 5th through August 5th). These findings support those of a 2005 study in south-central Montana, as well as those of a 2004 study in Mississippi. According to Kole Cordier, their research is meaningful to the people of the Flathead Nation because it provides greater understanding of the species that live on our reservation. The awareness of bat colony locations allow for better planning of development, to ensure the survival of the colony as well as reduce potential dangers of human and bat cohabitation. And for Salish Kootenai College, Cordier’s and Edmo’s research provides the groundwork for future SKC Science Education and Natural Resources students and encourages students to continue to experience real world research, with real world impact. What’s next? Among the many things still to be studied by Salish Kootenai College students in the future, winter/hibernation activities, species distribution and cohabitation with swallows figure prominently. Keely, B.W., & Tuttle, M.D. (1999). Bats in American Bridges (4th ed.). Austin, TX: Bat Conservation International Incorporated.